Kerala was put on high alert after 288 sunburn/sunstroke cases were registered in the state since March 1, 2019. There were four suspected cases of sunstroke deaths in the month and temperatures reached 40 degrees Celsius ( degrees Celcius) in the northern district of Palakkad, The Indian Express reported on March 28, 2019. In Bengaluru, a city where the average summer temperature rarely crosses 26 degrees Celcius, temperatures of around 37 degrees Celcius caused dehydrated birds to fall out of the sky in March 2019, this report in The New Indian Express said. Other regions of central Karnataka--such as Kalaburagi (40.6 degrees Celcius), Ballari (40 degrees Celcius) and Raichur (39 degrees Celcius)--also reported severe temperatures. Mumbai recorded a maximum temperature of 40.3 degrees Celcius on March 25, 2019, seven degrees above normal for the city. High temperatures--above 40 degrees Celcius--were experienced in north India, especially in areas around the national capital region. At 39 degrees Celcius on March 22, 2019, Delhi dealt with its warmest March in nine years. These events mirror those of the summer of 2018, which was declared the sixth warmest since 1901, as per a Lok Sabha (lower house of the parliament) reply on February 6, 2019. The annual mean surface air temperature across the country in 2018 was 0.39 degrees Celcius above the average observed between 1981 and 2010. The average maximum temperatures during April and June this summer are likely to be higher than normal by 0.5 degrees Celcius over most of the meteorological subdivisions in central India and some subdivisions in northwest India, an India Meteorological Department (IMD) release on April 1, 2019, said. Among the five warmest years in India since 1901, 2016 (+0.72 degrees Celcius) recorded the highest average temperatures, followed by 2009 (+0.56 degrees Celcius), 2017 (+0.55 degrees Celcius), 2010 (+0.54 degrees Celcius) and 2015 (+0.42 degrees Celcius). Phalodi in western Rajasthan hit 51 degrees Celcius in 2016, the highest ever anywhere in India, breaking the previous high of 50.6 degrees Celcius recorded in Alwar in 1956. Eleven of the warmest years in India since 1901 were between 2004 and 2018, official data show. 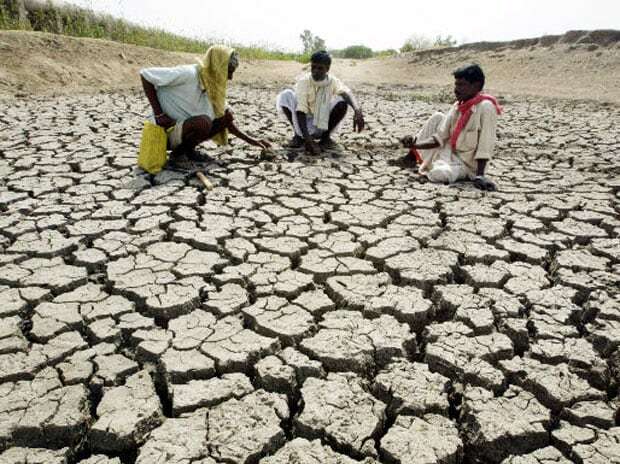 “India has experienced [a] manifold increase in the human deaths during various heatwaves of years like 1971, 1987, 1997, 2001, 2002, 2013 & 2015,” Harsh Vardhan, ministry of earth sciences, told Lok Sabha. A heatwave is defined differently for varying topographies: in the plains, the maximum temperature has to be 40 degrees Celcius or above; in coastal areas, 37 degrees Celcius or more; and in hill regions, 30 degrees Celcius or more, according to the India Meteorological Department (IMD). In India, heatwave conditions are usually experienced between March and July, with acute heatwave events occurring mostly between April and June. High temperatures caused by climate change are affecting the lives and livelihoods of people across India, forcing them to adapt to new weather conditions, a six-part series by IndiaSpend shows. In 2013, the Ahmedabad Municipal Corporation launched a Heat Action Plan for Ahmedabad, which the National Disaster Management Authority (NDMA) advised all states to use as a template for their own plans. Key components included an extended seven-day forecast during the summer months, a colour-coded warning system for citizens, and a massive public awareness campaign. From 2015, the Indian Meteorological Department (IMD) started providing five-day city-specific summer forecasts in 100 cities. By 2017, 11 states--Odisha, Telangana, Bihar, Maharashtra, Gujarat, Andhra Pradesh, Jharkhand, Karnataka, Haryana, Delhi and Uttar Pradesh--and 17 cities had adopted or were developing heat action plans. Extended forecasts were being provided to more than 300 cities, Vardhan said in an another Lok Sabha reply on February 4, 2019. Heatwave deaths declined by 97% over two years from 700 in 2016 to 20 in 2018 due to improved forecast and heat action plans, another Lok Sabha reply on February 6, 2019, said. There are two prerequisites to address the rise in temperatures and resultant casualties, Dholakia said. First, limit the global temperature rise to less than 1.5 degrees Celcius, as advocated by the Paris Agreement of 2015. “More ambitious global mitigation efforts will translate into a lower probability of such extremes,” Dholakia said. Developing early-warning systems to anticipate and respond to such extreme weather events at national and local levels is the other measure that can help, he added. “However, planning also includes plugging gaps in knowledge--developing a climate risk atlas for India, continual risk assessments and updating response plans--addressing gaps in capacity building at national, state and local levels and creating innovative financial instruments such as catastrophe bonds, insurance instruments and so on to absorb the financial losses and protect livelihoods,” Dholakia added.